Tiny houses are often favored over large campers because of their beautiful and often luxurious interiors. These tiny homes on wheels offer all of the amenities of a traditional home so people can feel comfortable in them all year long. In this post, we’ll tell you everything you should know about tiny house appliances and amenities. Tiny house kitchens are often focal points and many tiny house owners devote most of their living space to their kitchens. In the next few sections, we’ll go over the amenities that you can typically find in a tiny house on wheels. Most tiny house owners go with small RV stoves that run on propane. These stoves usually have three burners on top and an oven that is large enough to fit a chicken but definitely not a turkey. The benefit to a small stove like this is that it does not weigh as much as a residential stove. A 22″ three-burner stove might weigh in at around 60 to 70 pounds. Also, the three-burner design makes it much more narrow than a typical four-burner stove. It is also shorter too so you can usually put storage underneath of it. An alternative to the gas oven might be a convection oven that can function as a microwave as well. Some people like to go this route since it gives them microwaving abilities without having to add an additional microwave. Some people opt to forgo the oven altogether. These people might go with a gas stove top or even an induction stovetop. This can cut down the weight significantly which is important for tiny houses on wheels. Practically every RV I’ve seen has a microwave in the kitchen. With tiny houses, however, you don’t always see people using microwaves. When you do see microwaves in the kitchens, they are usually built in overtop of the stove. This helps maximize space and allows for venting since a vent will usually be built into the tiny house just underneath the microwave. When building a tiny house kitchen, it is important to decide whether or not you’ll actually use a microwave as they do take up valuable space and can add at least another 20 pounds to the weight of your tiny house. Also, they require a lot of power so you’ll most likely need to be hooked up to the grid or to a generator to use them. Of course, you can get low-watt microwaves but they do take longer to cook which eliminates any benefit they may have had. The ideal refrigerator for a tiny house on wheels is a 3-way refrigerator that can run on gas, DC power, and AC power. This gives you the ability to run your fridge on grid power as well as on gas power while on the road. If you decide to add solar to your tiny house, you can even run your fridge on DC power. If you won’t be moving your tiny home on wheels very often, you might want to opt for a residential fridge. A residential fridge will add a lot of weight to your tiny home and you’ll need grid power to run it but you’ll be able to store a lot of food. Also, residential refrigerators are much less expensive than 3-way RV refrigerators. You could end up spending twice the amount of money for a 3-way fridge as you would for a standard residential fridge. Most people with tiny homes on wheels do not have dishwashers in their tiny homes. These appliances require a lot of water and electricity and they take up a lot of space. Also, a dishwasher weighs a lot so it can be a burden to some tiny home owners. Many people will opt to hand wash their dishes and they’ll add some counter space for a drying rack. This saves them room, weight, and even money as they have one less appliance to purchase. Also, if you ever do decide to add a dishwasher in later, you can always buy a tabletop version. These small dishwashers do not have to be plumbed into the system and they can be installed and removed in just a few minutes. They also weigh a lot less, so traveling with them is much easier. Since most people hand-wash their dishes, it is important that they have large sinks. Deep, double-sinks are often seen in tiny houses on wheels as they make washing dishes much easier. Additional counter space should be added to the side of the sink so that dishes can be left out to dry afterward. This counter space can be used for meal preparation so it isn’t wasted when dishes are not drying. In some climates, it’s easier to go with an outdoor kitchen. A grill and an outdoor sink could completely replace the need to have a kitchen inside. Just get a small fridge and place it in your living area so you’ll have someplace to store your food. Pack some folding chairs and a folding table into your tow vehicle and you have a fully functional dining room to go with your outdoor kitchen. For warm, but wet climates, you may also want to pack an overhead awning so you’ll have some shelter from the rain while you’re outside cooking. Some tiny house owners go with off-the-grid bathrooms while others choose more elaborate ones. If you plan on full-timing in your tiny house on wheels, you may want to go with a more elaborate bathroom, otherwise, it might be safe to still to a cassette toilet and small sink. There are so many different toilet options for tiny homeowners to choose from that it can be hard to decide on just one. People looking to go off-grid can go with composting toilets, cassette toilets, and even incinerating toilets. People looking to park their tiny homes at full hook-up sites might want to go with a standard RV toilet. These toilets could be plumbed to a black water tank for areas that do not have full hookups. For more information on this, check out our post titled, “Do RVs Have Water Tanks“. Some tiny homeowners do not have showers in their tiny homes at all. These people may use the showers at the campground or at a local fitness center or truck stop. Others, go with small wet baths. These wet baths also house the toilet so no space is wasted. In most cases, you can only shower in a wet bath but you do save a lot of room by using one over a standard bathtub. Large bathtubs with tile walls can be found in other tiny homes. These are usually in tiny homes that do not move very often and who have access to water and sewer hoses. Gray water tanks can be added for traveling so that these bathrooms can be used while on the road. Some small tiny homeowners have decided to leave the sink out of the bathroom. Instead, they’ll use the kitchen sink or the shower to wash their hands. This saves on space and reduces the weight of the tiny home. The drawback to this is that you lose your ability to brush your teeth inside your tiny home’s bathroom. Personally, I’d rather have a small sink with a mirror in my tiny home’s bathroom and save room and weight somewhere else. Some bathrooms even have washers and dryers built into them. Tiny homes with washers and dryers will need a 50-amp power system and they’ll need to be hookup up to the grid to run their machines. In most cases, the washer and dryer are built into one combination machine to save space and weight. Even so, a washer/dryer combination is heavy so you’ll want to think long and hard before you decide to install laundry facilities in your tiny home on wheels. I know many tiny homeowners do not worry about having an entertainment system in their tiny home. They will often set their living rooms up with a comfortable chair or loveseat for reading and relaxing and they spend the rest of their time enjoying the outdoors. Other people take a different approach and they make their tiny homes a great place for watching TV and listening to music. Televisions can be mounted to the walls to save space and to be viewed from different rooms. This eliminates the need to have multiple televisions and cuts down on weight. Other people decide to go with a projector and a projector screen instead. This saves a lot of weight and reduces power requirements. Also, the projector can just as easily be taken outside and movies can be watched on the outside wall of the tiny home rather than inside of the tiny home. Car speakers are easy to mount into the interior and exterior walls and a person living in a tiny home can run them off of their 12-volt batteries. These systems are built to withstand the elements so they are great for tiny houses on wheels. Alternatively, some people just use Bluetooth speakers attached to their phones or computers. These speakers are small and portable so they can be used both inside and outside of the tiny home. Many tiny homeowners are able to live a mobile life because of their ability to work from home. For this reason, you’ll see many tiny homes with built-in offices that rival the offices you’d see in many people’s apartments. Satellites can be installed on the roof to boost Internet signals and laptops can be used in place of desktop computers. Laptops have lower power requirements and can be used even when the tiny home is off-the-grid. Many tiny homes make use of lofts. These lofts are often above the bathrooms and kitchens as lofts placed over living rooms can make the living rooms feel cramped. Others turn their living rooms into bedrooms by using futons and dinettes that convert into bedrooms. Lofts provide more space and dedicated beds but they can be difficult for some people to climb in and out of each night. Large tiny homes can often get around having to climb into lofts by adding small staircases. These staircases can double as storage so space isn’t completely wasted. Futons and fold-up beds are common in tiny homes. Murphy beds are used a lot as well. These beds are usually installed vertically but they can be installed horizontally as well. For more information on installing Murphy beds, take a look at the post titled, “How to Install Murphy Beds“. Alternatively, you could have an elevating bed installed. These beds usually come down over the living area and can be raised back to the ceiling when not in use. Many people are now turning to beds like this as they offer the benefit of a Murphy bed without using up valuable wall space. Also, since they aren’t being folded up, the bedding does not have to be tied to the mattress before it is raised back into position. Beds built into lofts are usually the most comfortable because standard mattresses can be used. Most tiny homes can easily fit king and queen size beds in their lofts. The lofts not only provide an area for a big bed, but they also offer a separate space for people to hang out in when they want to spend some time away from their housemates. 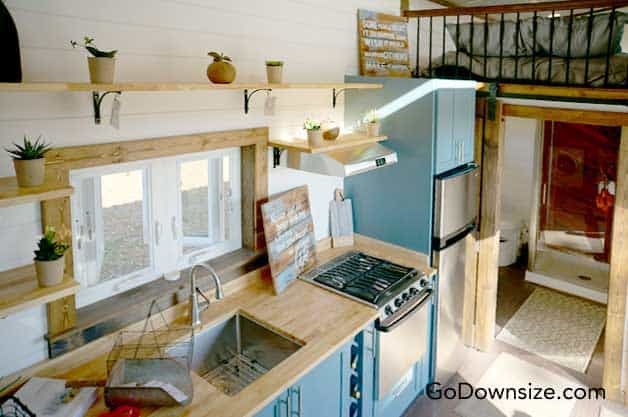 Tiny homes on wheels can often be short on space and bedroom storage isn’t always possible. However, some tiny homeowners prioritize storage space in their bedrooms and even have walk-in closets built within. If space is at a premium, overhead cabinets can be built into bedrooms and even into lofts. Just be careful how much weight is stored at the top of the tiny home as top-heavy tiny homes are more likely to tip over while in transit. Many tiny homeowners like the idea of placing luxury items like granite countertops and marble floors inside of their tiny homes. They often argue that because the space is so small they won’t have to spend much to get the luxury materials that they’ve always dreamed about in their larger homes. This thought is true and it is much cheaper to furnish a tiny home with fancy finishes and luxury amenities. Unfortunately, these items can often be heavy and they aren’t always functional. For this reason, it is better for tiny homeowners to think about the utility of the item before bringing it into their tiny home. Here are some luxury items that you might want to consider for your tiny home. One great luxury item that provides a lot of utility is a large skylight. Skylights provide natural light, bring in passive heat and offer wonderful views of the night sky. This makes the skylight one of the best amenities you can put into a tiny home. Another luxury item to think about is custom-made furniture. Custom furniture will fit better in a tiny home than furniture bought from a big box store and it can be made to be functional, lightweight, and beautiful. Many tiny homeowners have custom countertops, custom couches, custom tables, and custom chairs made especially for their tiny homes. The addition of just a few custom pieces can make a big difference in how luxurious a tiny home feels inside. Solar power isn’t often thought of as a luxury but that doesn’t mean that it isn’t one. Having a solar power system gives you the luxury of being able to go off-grid for longer periods of time without having to sacrifice the use of your electronics. It also gives you the luxury of lower utility bills since the solar panels can help you reduce your reliance on the grid. Tiny homes on wheels can have all the amenities of a standard home. This being said, the more amenities you put into your tiny home the heavier they will get. heavy tiny homes can be difficult to move and a larger tow vehicle will certainly be needed to do so. When planning out a tiny home’s amenities, start off by deciding on what you actually need. If you don’t need something, don’t bother putting it into your tiny home. Even if the item fits, it will still unnecessarily weigh your tiny home down and your gas mileage will suffer. Also, it will make your tiny home feel smaller than it needs to as you’ll have less space to move around and less space to store the items you actually do use. Also, think about buying appliances that serve more than one purpose. For example, if you must have a washer and a dryer, get a machine that can both wash and dry clothes. If you need a television, consider getting a laptop with a big screen so your computer can serve as a television as well.